Posted on April 13, 2012 at 10:40:38 am by Holly H.
There&apos;s still time left this season to experience Indiana’s first and Fort Wayne’s only all-female, flat track roller derby league, the Fort Wayne Derby Girls. There are two home bouts left, on April 21 against The Chicago Outfit, and May 12 against the Killamazoo Derby Darlins, both held at the Allen County War Memorial Coliseum. 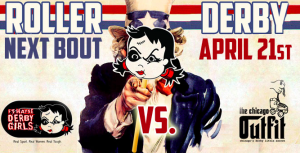 The first 500 fans at the April bout will receive a free Derby Girls poster upon entry. And anyone attending that same bout who holds a military ID can receive one free ticket. 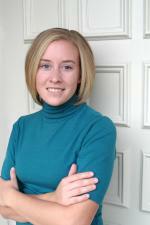 Roller derby is an endurance sport and a refreshing take on women’s athletics. The Fort Wayne Derby Girls league, was co-founded by two local women in 2005, and has since grown from about half a dozen skaters to about 50. 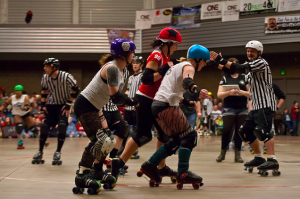 Countless volunteers and fans join the ranks in support of the Derby Girls. Tickets for bouts at the Memorial Coliseum can be purchased through Ticketmaster or in person at Memorial Coliseum Box Office, at 4000 Parnell Ave. Home bouts begin at 6 p.m., with doors opening at 5 p.m. Keep in touch with the Fort Wayne Derby Girls online, via Facebook and Twitter. For 2012, the Derby Girls have elected to donate proceeds from bouts to local non-profits including: Matthew 25 Health and Dental Clinic, the Fort Wayne Sexual Assault Treatment Center, Super Shot and Riley Hospital for Children in Indianapolis.